Hareline Lateral Scale Opal Mirage Flashabou will light up your fly pattern with a single strand. 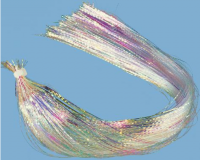 This Flashabou is horizontally crimped and adds lots of flash to flies, especially when used as a lateral line on baitfish streamer patterns. Not only is this material flashy, but durable as well.